Four tips to get your business found with voice-activated search. 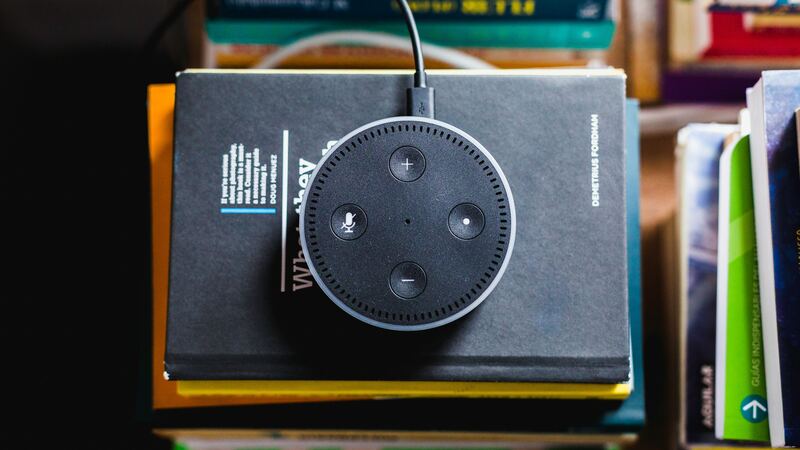 This year’s Cyber Monday and other holiday shopping may bring the tipping point to the use of voice-enabled, digital assistants. Smart speakers like the Amazon Echo and Google Home are among top gifts, and ownership of these devices is expected to rise to nearly half (48%) of U.S. consumers after the holiday season (up from 32% in August according to Adobe Analytics’ new research). At this pace, more than half of U.S. consumers will own a smart speaker by early 2019. That 50% market adoption is a critical point for a product to become mainstream, as we’ve seen with the televisions, mobile phones and other innovations that are now part of our everyday lives. Smart speakers are driving the rise in voice usage, but if you own a smartphone you’ve probably asked its virtual assistant for help finding a nearby gas station or checked on the weather. Mobile voice searches tend to be hyper-local, 3X more so than text-related searches. While Siri acts more like a drunk elf turning your words into mayhem, the voice recognition technology in smart speakers has become far more advanced. So much so that ComScore predicts that by 2020, 50% of all searches will be done by voice. 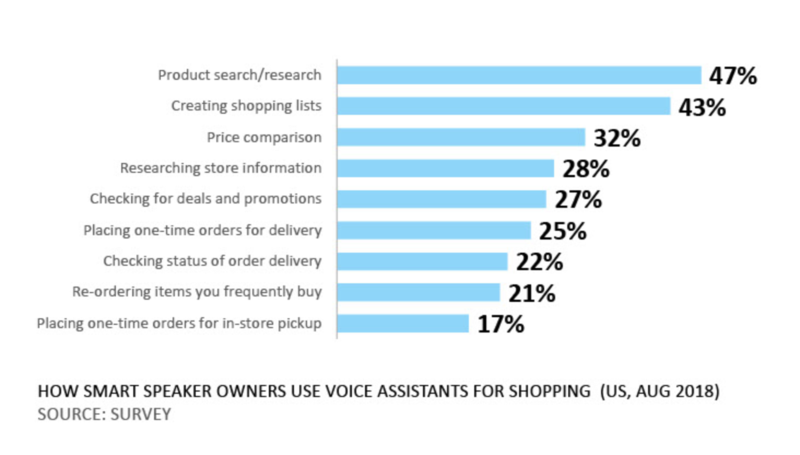 We’re already seeing increases in voice shopping, with 30% of smart speaker owners saying they use their devices for shopping or ordering items, as well as product research and price comparisons. For now, traditional touch search still leads, but as voice technology becomes more reliable and word accuracy increases, we’ll be able to have more of a dialogue with our virtual assistants rather than relying on a few keywords. That is the real game changer. As Microsoft’s Search Evangelist Christi Olson said at this year’s Internet Summit in Raleigh, voice search isn’t the next big disruptor. It’s conversational AI shifting consumer behavior and the way we discover and engage with brands. So how do you optimize your business and search strategy for voice? While text-based search engines typically show pages and pages of results, you must own that top position to be sourced by a voice assistant. There is no position two in voice search results, so you need to up your SEO game to ensure being found. Voice search results usually source from “featured snippets,” which are the “answer boxes” that appear at the top of the organic search results — think Wikipedia, which is the most featured site. Most of these snippets come from the top 10 ranked pages, so while it’s not required to be the #1 organic SERP, it will increase your chances of being sourced. As part of your SEO strategy, make sure your Google My Business page and other listings are correct and optimized with content to rank highly in the “near me” searches. Just as brands have seen the need for more images and videos to rank highly in search, content that is optimized for conversational AI will also need to be developed. Consumers will typically use more conversational and complete sentences with voice search than with text-based search. 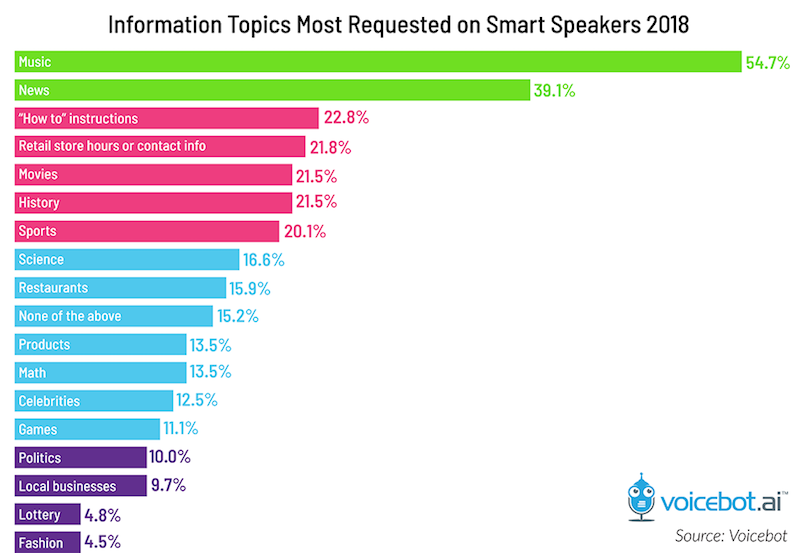 Although Amazon and Google aren’t releasing data on the voice search queries consumers are using, there are useful tools available to help uncover the most frequently used terms. These include SEO tools such as MOZ and SEMRush, as well as your paid search data analytics and Google Search Console. A Google search will also bring up “Related Searches” that can identify new phrases and types of queries that can be integrated into your content marketing strategy. Search query data gives unique insights into the needs of your customers and where they are in the consumer journey. They are sharing all types of useful, intent signals that you can use to develop content that delivers value, builds trust and moves them along the path to purchase. 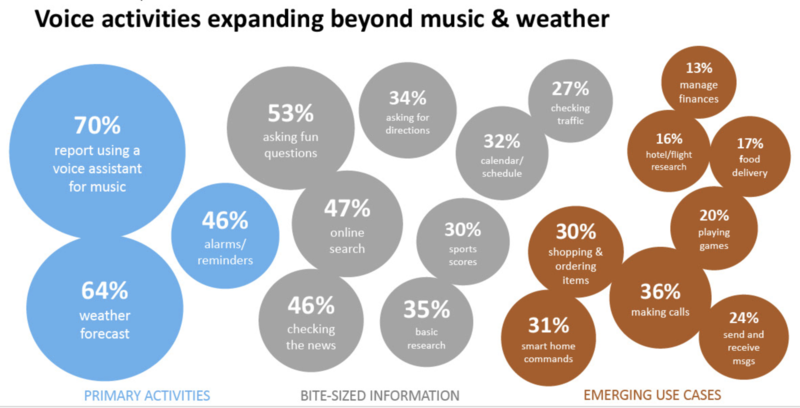 While news and music are the most frequently asked questions by smart speaker owners, “how-to” instructions, store hours and product recommendations are also common. “If your content is provided in a question-answer form, you are more likely to rank highly on Google and gain Google’s coveted answer snippets,” says Nate Masterson, marketing manager for Maple Holistics. Smart speakers are driving the adoption of other voice-enabled technology, such as wearables, car devices, and even appliances. You can expect to see (hear?) voice search becoming more commonplace as consumers rely on them for more than just playing music or turning up the heater, but also make them a go-to for food delivery and booking travel. These conversations are a goldmine of intent data that can be used for creating more valuable brand engagement. While Google and Amazon currently limit advertising, there are workarounds, such as creating a branded Alexa Skill or Google Home app. Ad space is also available on podcasts, news sources and Alexa’s FlashBriefing; however, the audience reach and targeting are limited until smart speaker adoption grows. For brands that start experimenting in this space now, though, the lessons learned will give them a commanding lead.